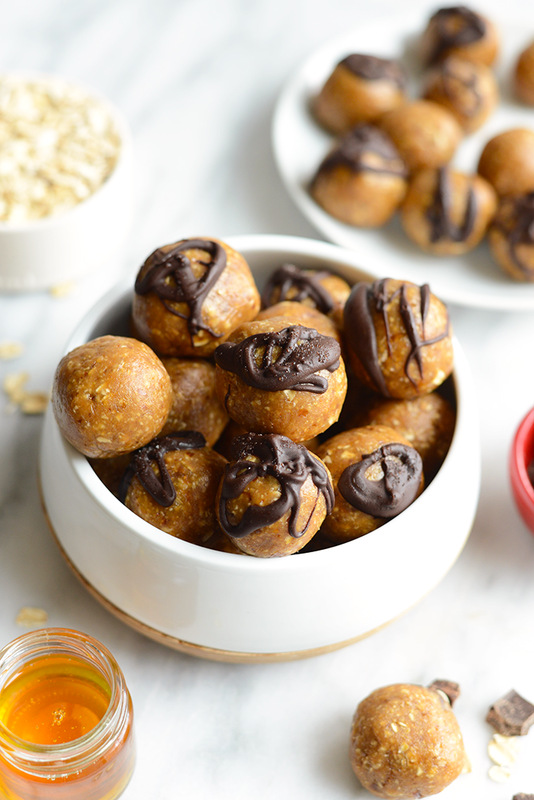 These peanut butter energy balls are everything you’ve ever wanted in a snack. 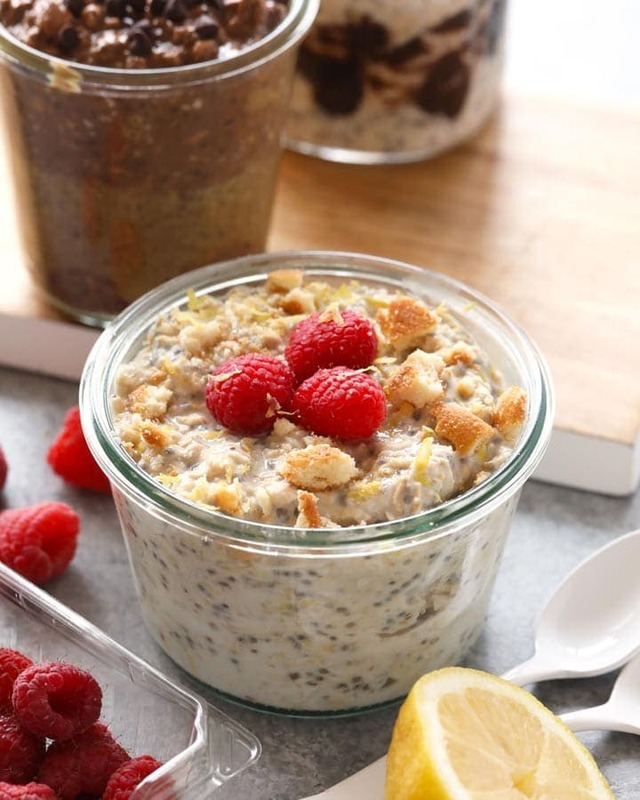 They’re made with real ingredients and in less than 10 minutes! 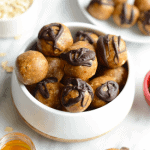 So, whip out your food processor and make the best healthy peanut butter balls on the planet. Are legit the peanut butter energy balls Lin and I make every single week. It’s nuts that this wasn’t the first ever recipe I posted on FFF because I’ve been making them for that long! 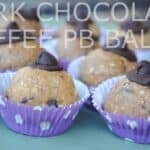 They’re the ball recipe I bring to every event I host and to every party I go to. They’re the ball recipe I bring to swoon over my boyfriend’s parents and they’re the balls I eat on-the-go. THESE BALLS ARE EVERYTHING TO ME AND THAT’S NOT EVEN A JOKE. 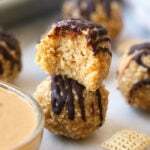 Every time I bring these peanut butter energy balls somewhere, I get asked what the recipe is. 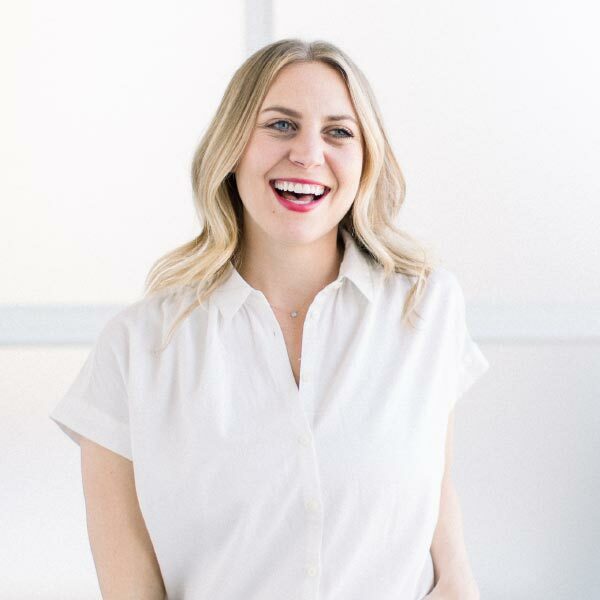 WHELP- instead of staring back with a blank face…I can now direct people HERE! Alright. 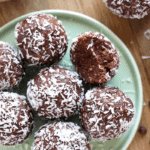 Let’s go over exactly what you need for these yummy peanut butter balls AKA peanut butter protein balls…because in every 1 serving you get 2g of protein! If 2g isn’t enough, you can add a scoop of your favorite protein powder for even more protein in every bite. So yes, these balls are as simple as throwing everything into your food processor and processing for 2 minutes then rolling into balls. What I like to do with my healthy peanut butter balls is lay them out on a cookie sheet and pop them into the freezer for a couple of hours before placing them in my “ball bag.” That’s right ladies and gents. I have a running gallon-size ball bag in my freezer that I just keep refilling. I find that my energy balls will last the longest things way and I actually prefer them a little frozen. We suggest keeping your balls in the freezer, but the fridge works too! If you keep them in the freezer they will last up to 3 months and in the fridge for up to 2 weeks. Storage: For best results, lay balls on a cookie sheet and place into the freezer for 2 hours. Then, transfer into a gallon-size freezer-safe bag and store in the freezer.